I had some big culinary successes this past week. I did quite a bit of experimenting with recipes, and thankfully, all were a delicious! Heat the oil in a large sauté pan. Add the onion and garlic and cook for several minutes. Add the black beans and the spices, onion powder through coriander. Cook until heated through. Scramble eggs in a separate pan. Warm up the tortillas in the oven wrapped in aluminum foil or in a pan. 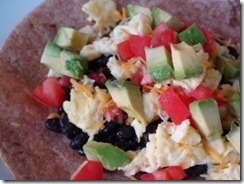 Assemble: top each tortilla with 1/2 cup beans, 1/4 of the eggs, 2 tbsp cheese, tomato, avocado and salsa. Optional: have reduced fat sour cream as an additional topping. I also made the Meal Makeover Mom’s Grab and Go Granola Bars again, but this time I used sunflower seeds instead of nuts so that I can send them with my son to preschool (it is a nut-free school). They turned out just as tasty, though personally I’d rather have the nuts! But if you have a nut allergy in your family or in a similar school situation, this works nicely. 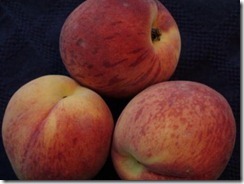 At the farmer’s market on Saturday I scored the season’s first Georgia peaches. They are so delicious and freshly picked the day before. I am not sure I’ll incorporate it into that many dishes this week as I think we are going to gobble them up as is. 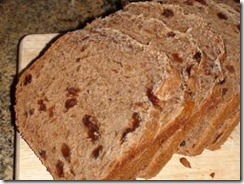 I also brought out the bread machine on Saturday as I have been craving a good cinnamon raisin bread. I’ve made a few different recipes, but decided to create my own. I must say, it was darn tasty! Here is my bread machine recipe though it could be adapted to use in the oven if you don’t have a bread machine. 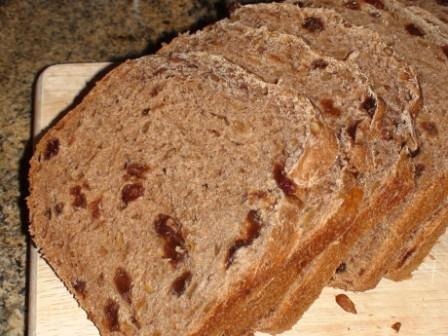 Place all ingredients in the bread machine in the order listed, except for the raisins and sunflowers. Choose the “Fruit & Nut” cycle. Add the raisins and sunflower seeds at the buzzer. Enjoy! My last culinary success of the weekend was Mango Raspberry Frozen Yogurt. But I will keep you in suspense as that will appear in another post soon! We enjoyed all of our meals this past week, and only one is bumped up to this week. My husband decided to cook Sunday night and he made another outstanding Chinese meal, though it will probably never be replicated because he can never remember what he does! We had a soup with chicken and mushrooms, then chicken breast with a garlic and ginger soy sauce with sautéed vegetables. Did you try any new recipes this week – either your own creation or someone else’s?